It has been 3 months since my last big post. 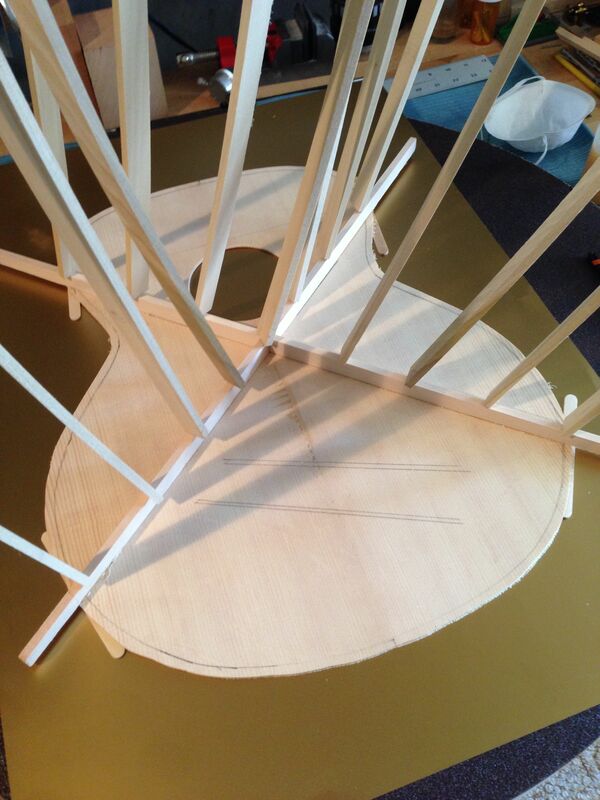 Catching up here are works in progress, finished guitars and instruments. 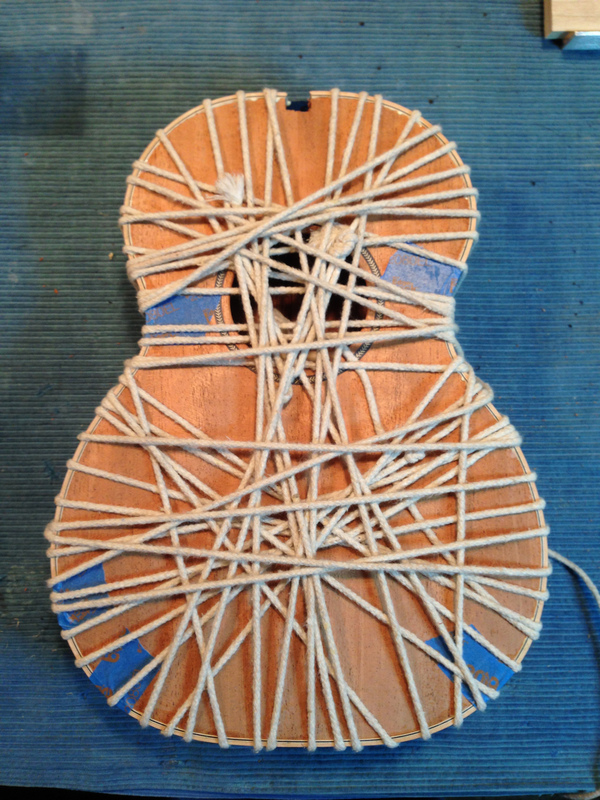 My latest instrument in the works is this Maple OM sized guitar. 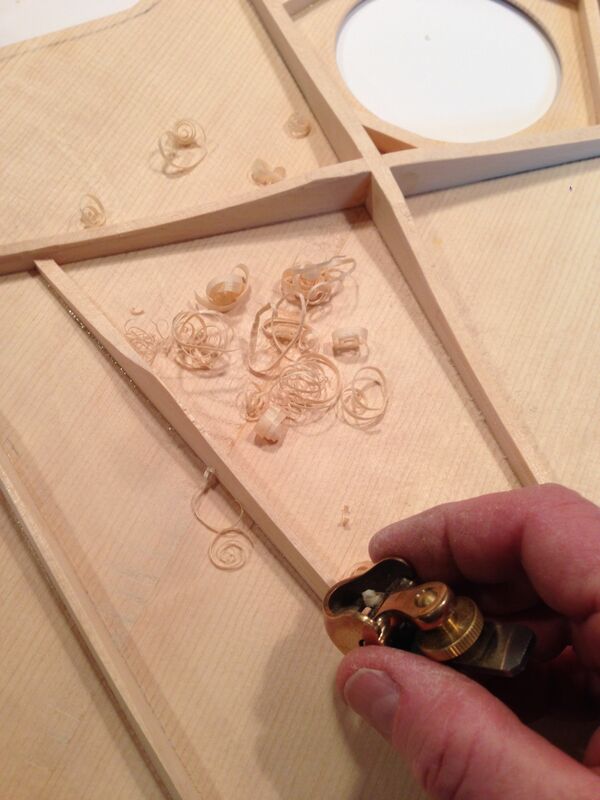 This build is getting lacquered at this time. 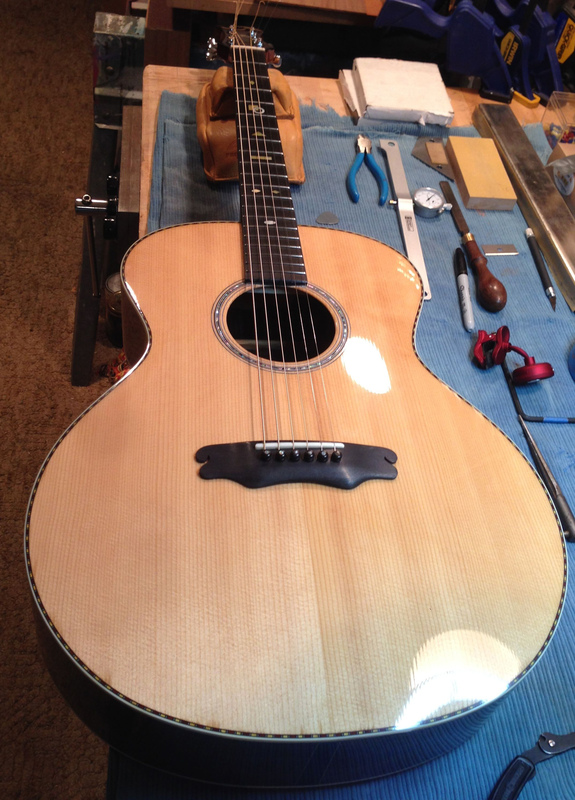 This is a steel string acoustic guitar with curly maple back and sides and a Bearclaw Sitka top. This guitar has a black and white color scheme. 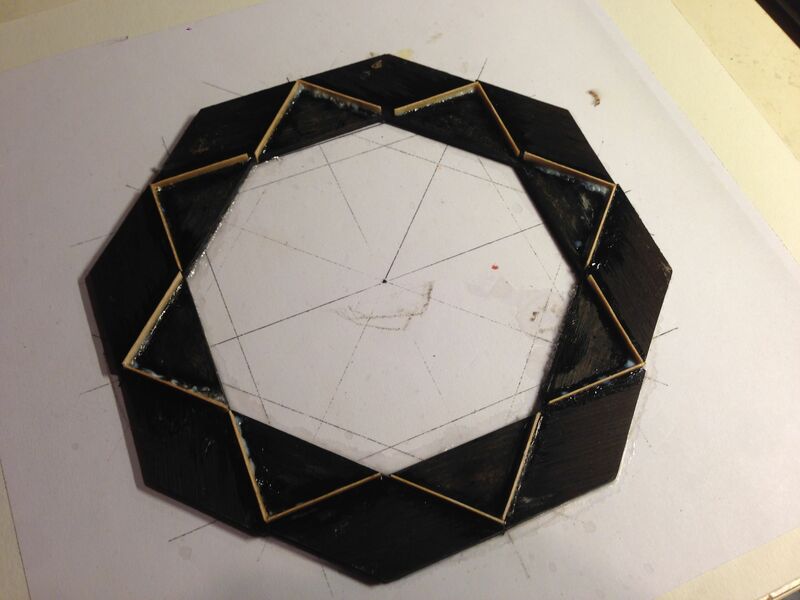 The rosette is ebony and maple, the binding ebony with a herringbone purling. 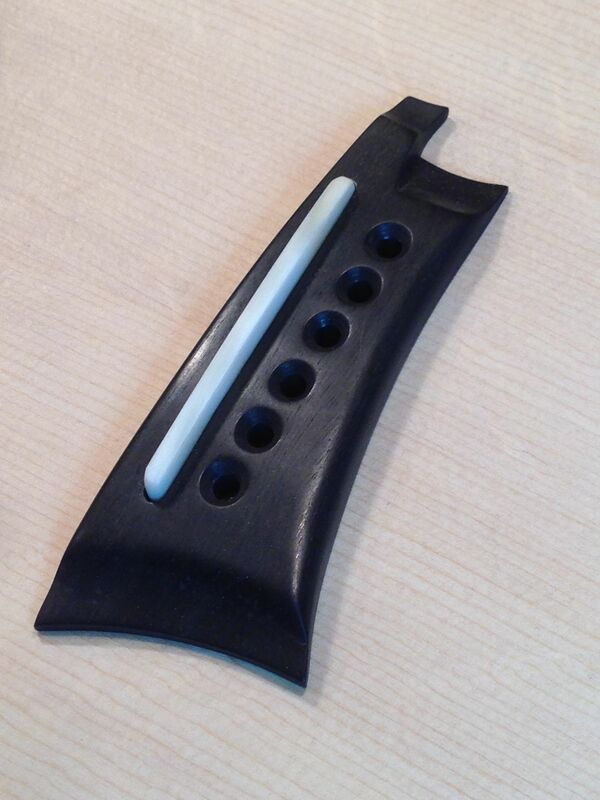 Ebony fingerboard with arrowhead inlays and an arc shaped ebony bridge design. 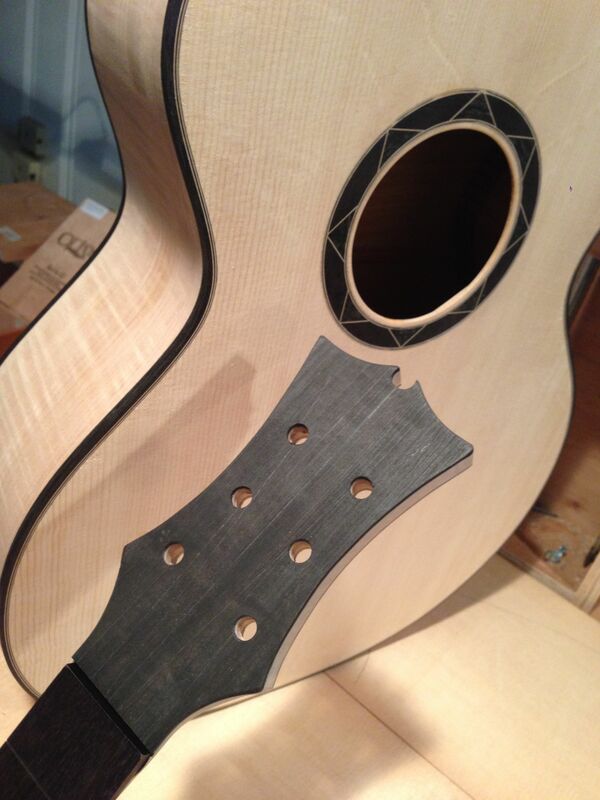 The back of the head plate has a steam bent quilted maple veneer and the headstock head plate is Ebony. The JR logo (not shown) is of white pearl. 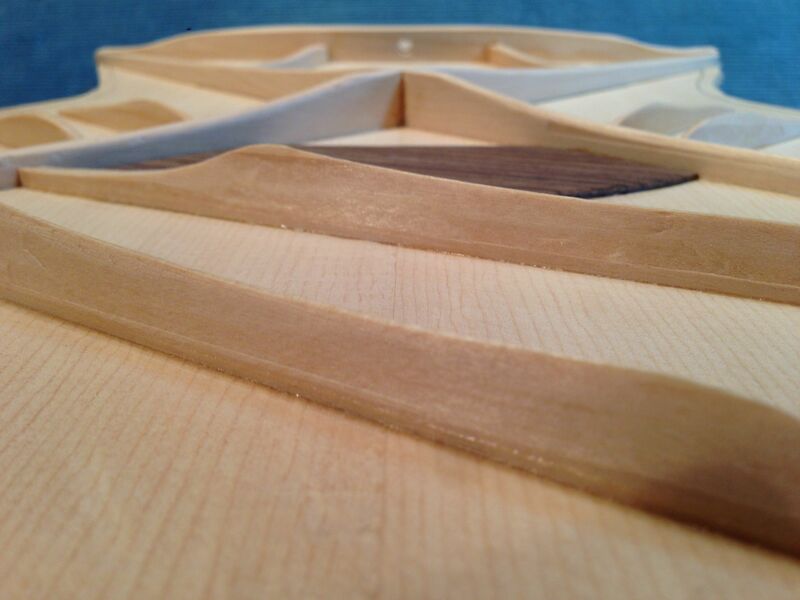 The photos below show some of the building process from this maple guitar. 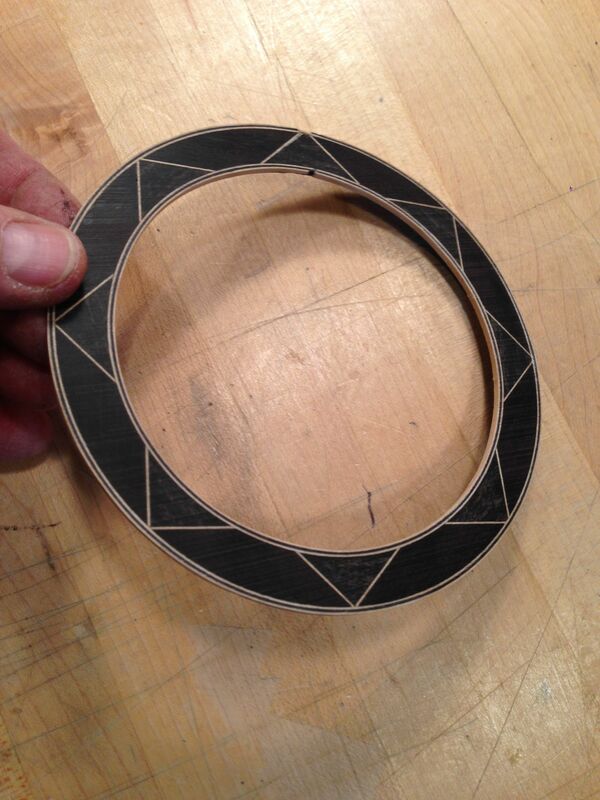 Geometric Rosette is assembled ready to be installed around the sound hole. X-Brace being attached with go bars. 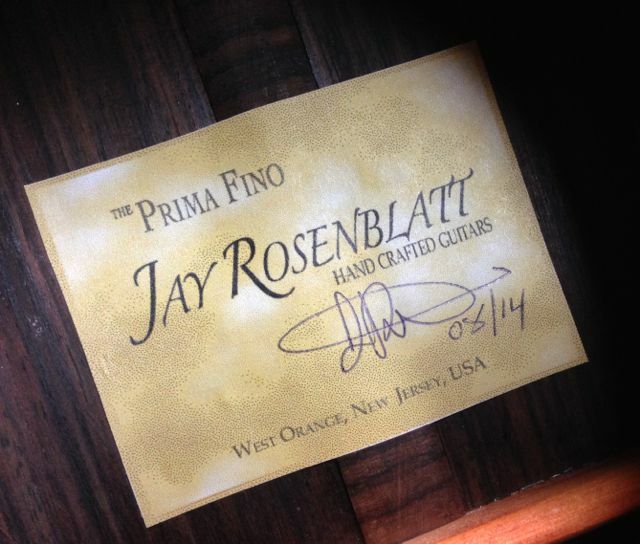 Neck carved and headstock shaped for a Jay Rosenblatt Guitar. 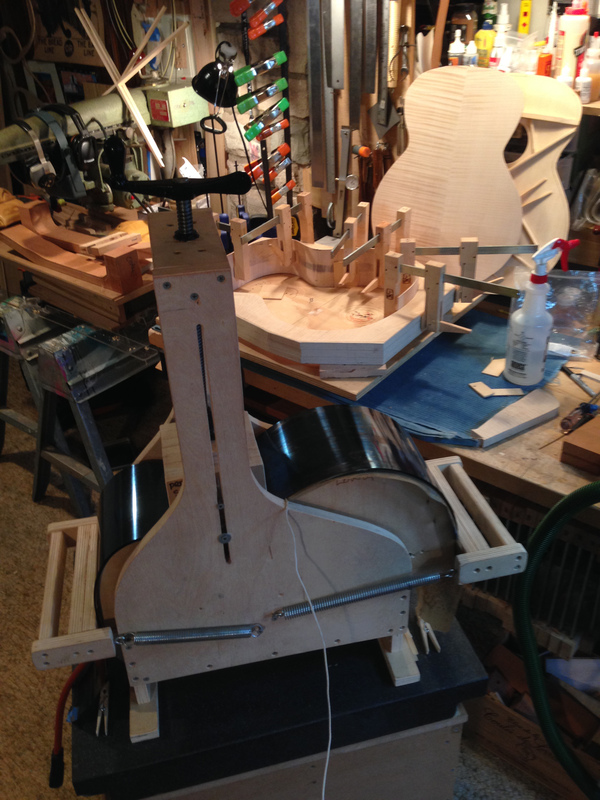 After body assembly the neck is fitted for proper angle and playability. 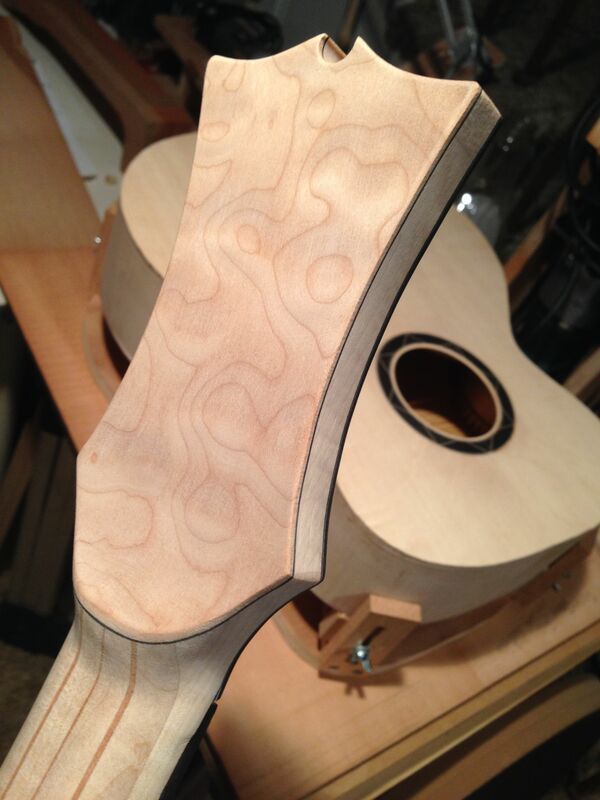 Rear view of Laminated Neck, heel joint. 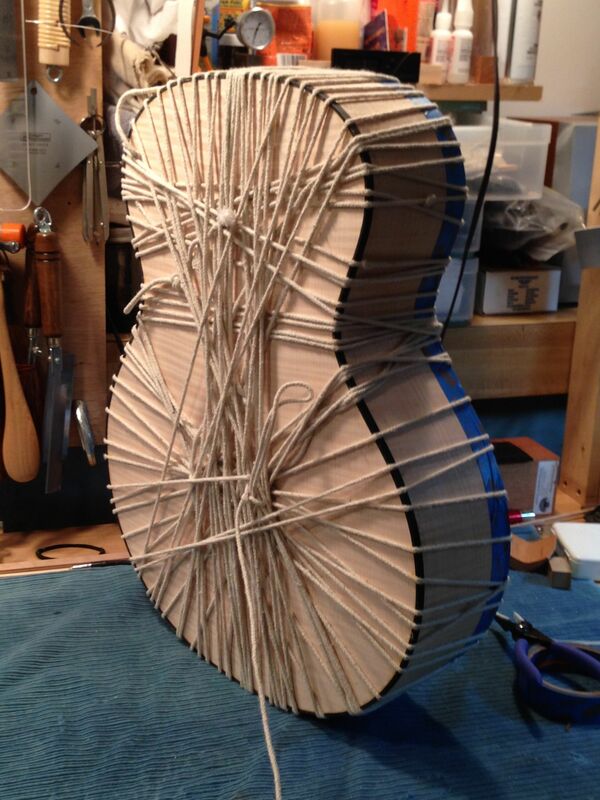 Neck is fitted for proper angle and playability. The bridge position is marked. 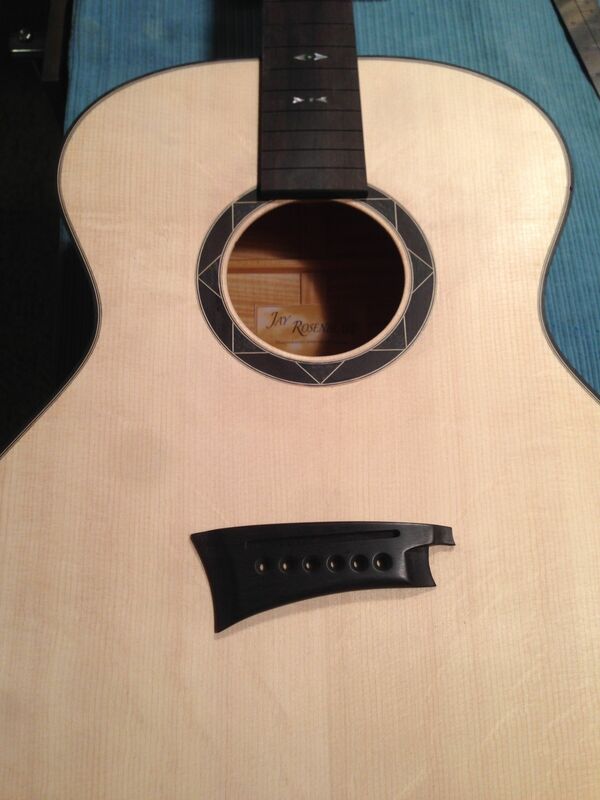 This guitar is currently in the finishing process. 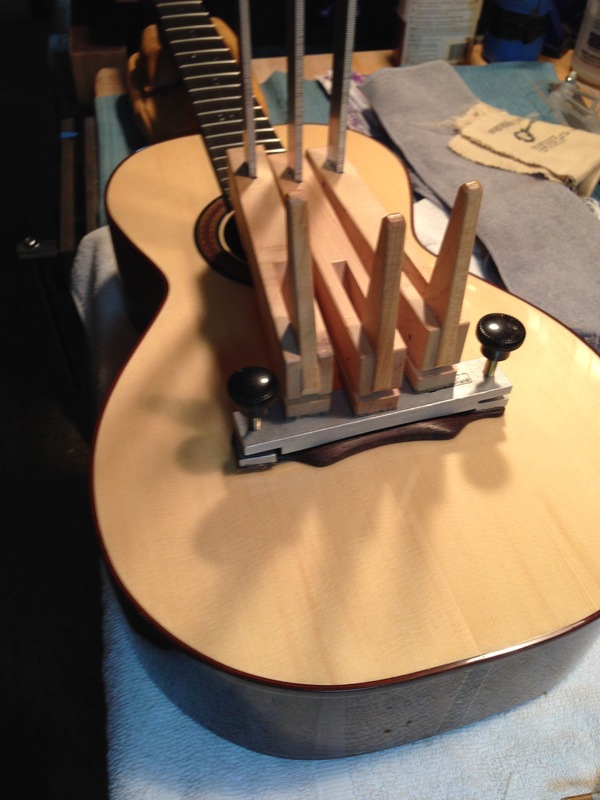 I hope to have it ready for the Woodstock Luthiers Showcase in October. 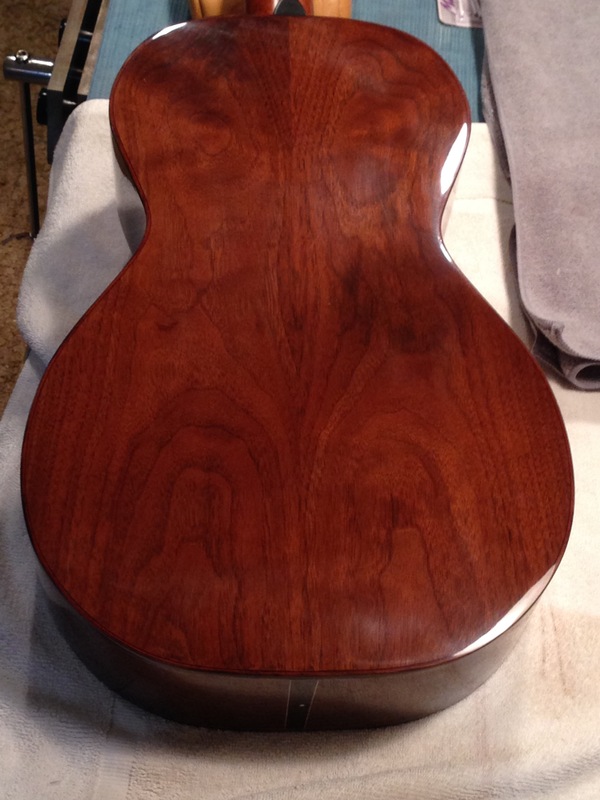 In a previous posts I showed a small walnut parlor guitar just before it went to the finisher, well this is now complete. 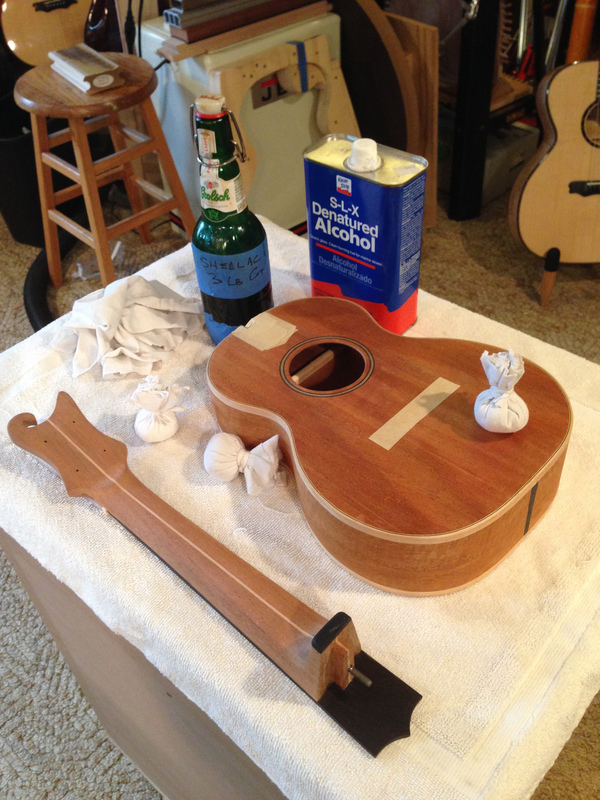 The finish of Nitro Cellulose has been done and the guitar is strung up. 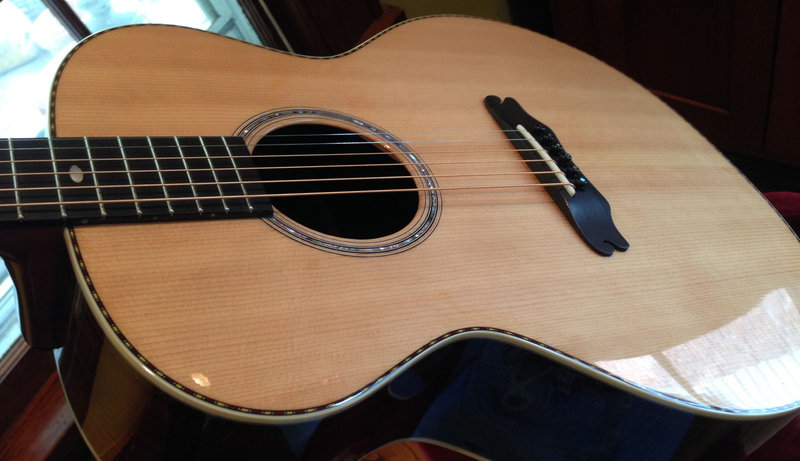 Hand built walnut Parlor Guitar by Jay Rosenblatt Luthier. 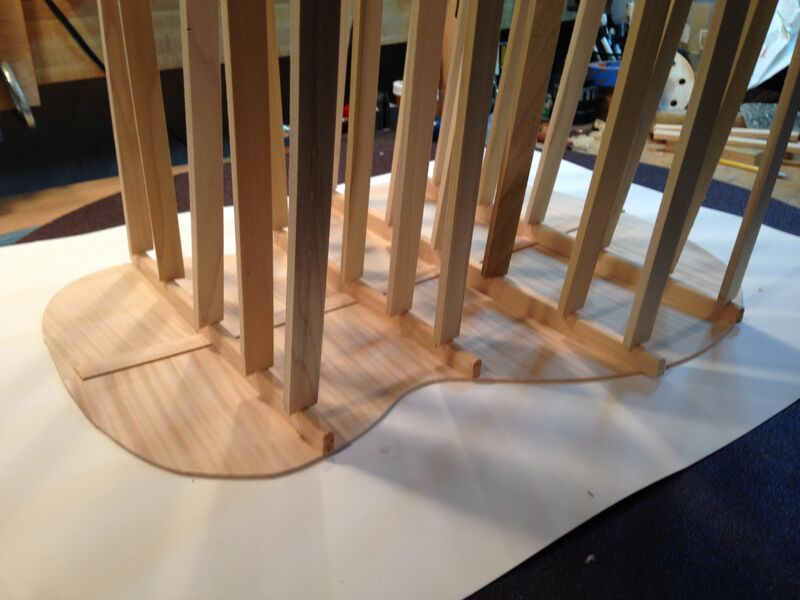 In the images below images you can see some of the final steps building process after the finish was applies. Its at that point I permanently attach the bridge and do a final set up for playability. This guitar who’s body is constructed from a piece of wood that came from a 50 year old American Walnut tree that was felled in the late 60’s. 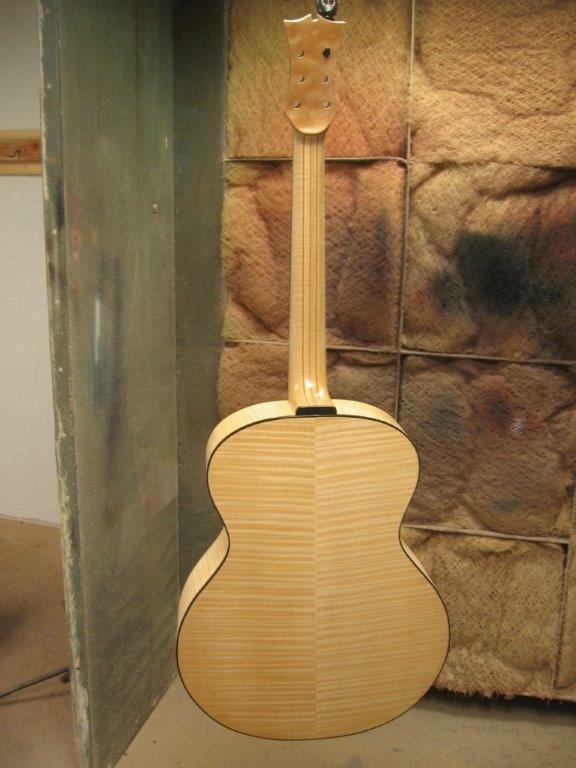 I cut the back and side set from it for this instrument, joined with a red spruce (Adirondak) soundboard. 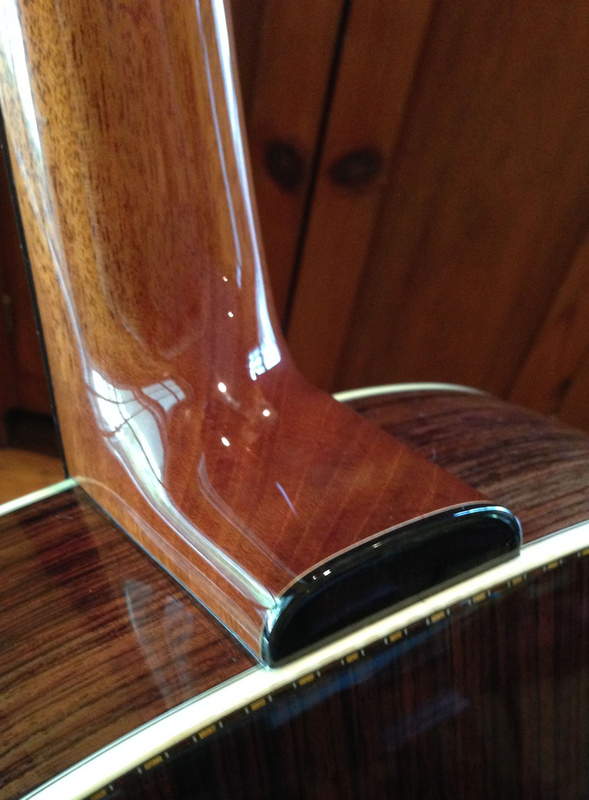 This guitar features a 24.9 scale length fingerboard in ebony with a rosewood bridge and head plate. 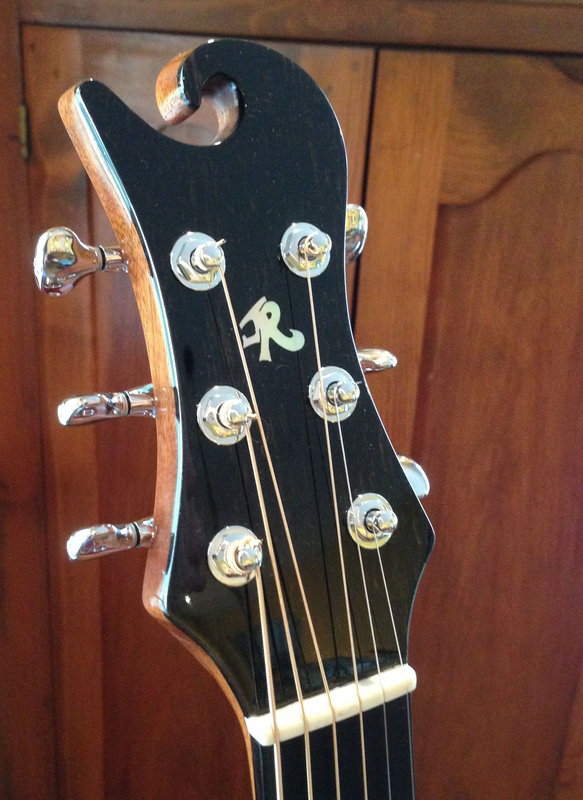 A mahogany neck with slotted headstock, bone nut and saddle and a classical style rosette. This is a steel string guitar with a clear and light tone. The inlays are of mother of pearl and abalone. The neck feels nice with its slightly wider fingerboard and shorter scale length making it a really nice finger style guitar. 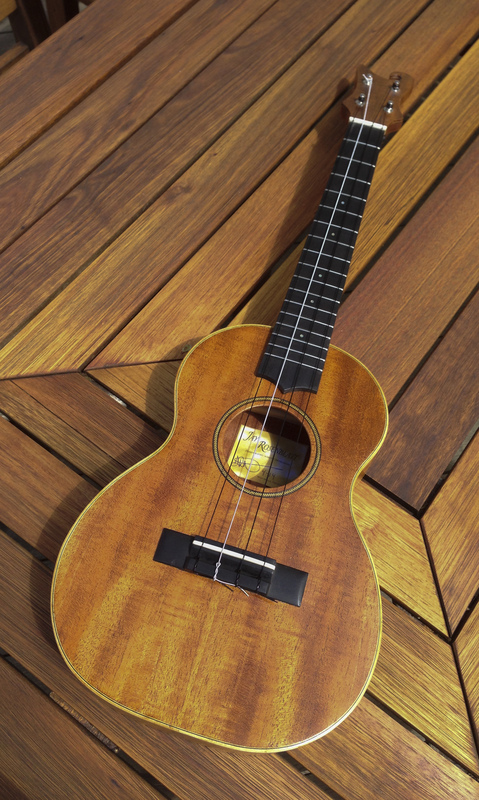 Another instrument I completed is a tenor Ukulele. 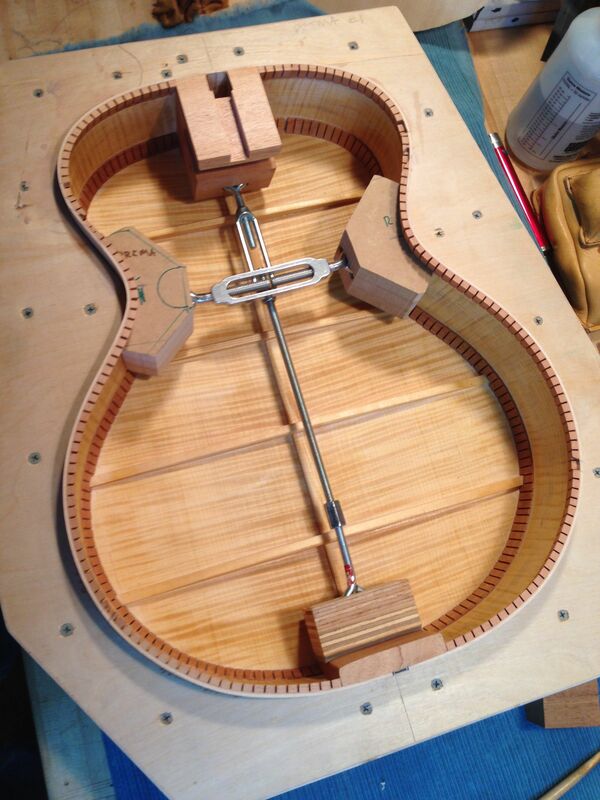 This small instrument is constructed of ribbon striped mahogany for the soundboard and back. 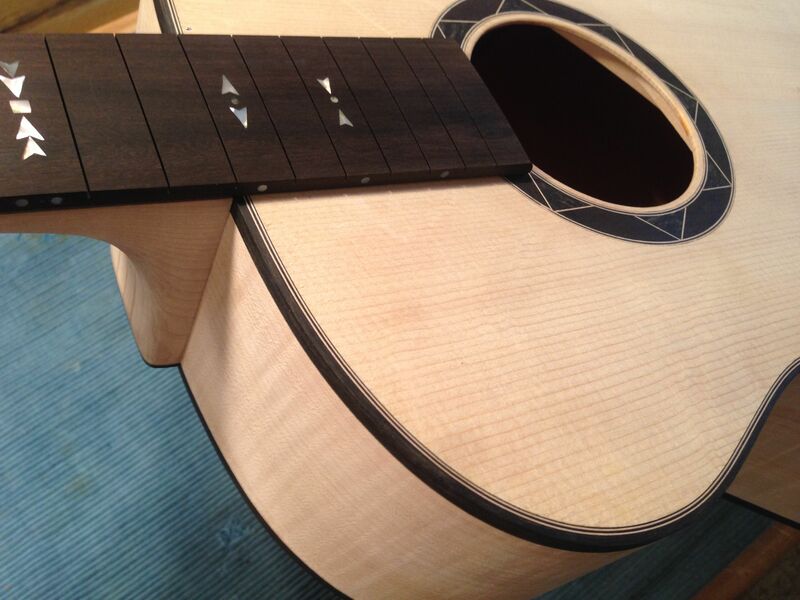 The sides are quilted mahogany. 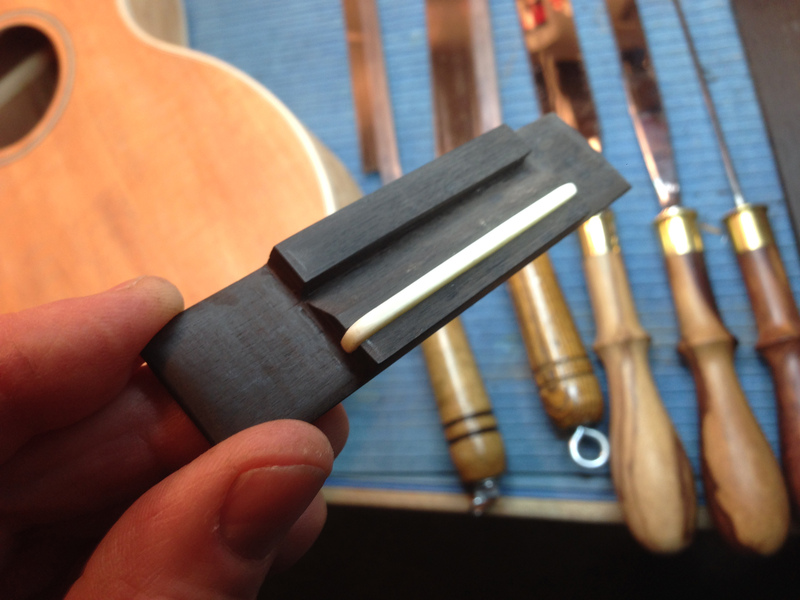 The fingerboard is ebony with MOP position markers as is the bridge. 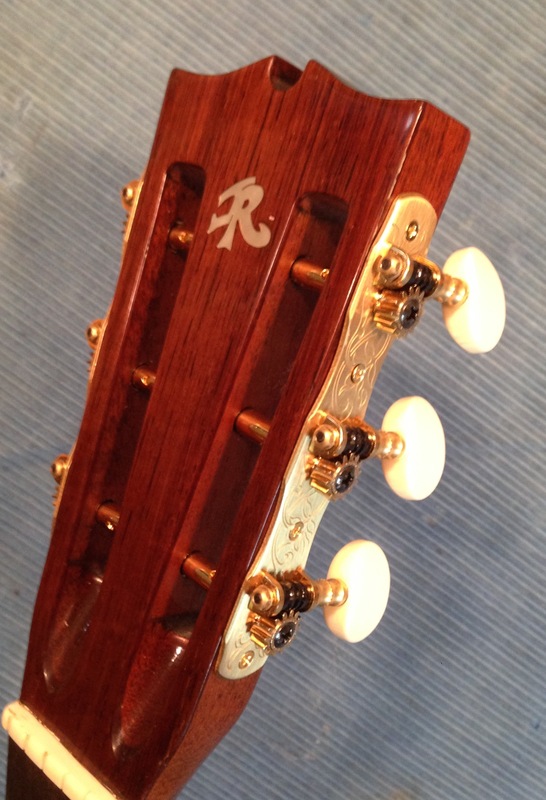 The headstock features my wave design and is of book matched Koa. The binding is maple with a black white fibre and the rosette is a chevron design. The neck on this is laminated with 40 year old mahogany which was repurposed from old Martin guitar neck blanks and has a maple center strip. 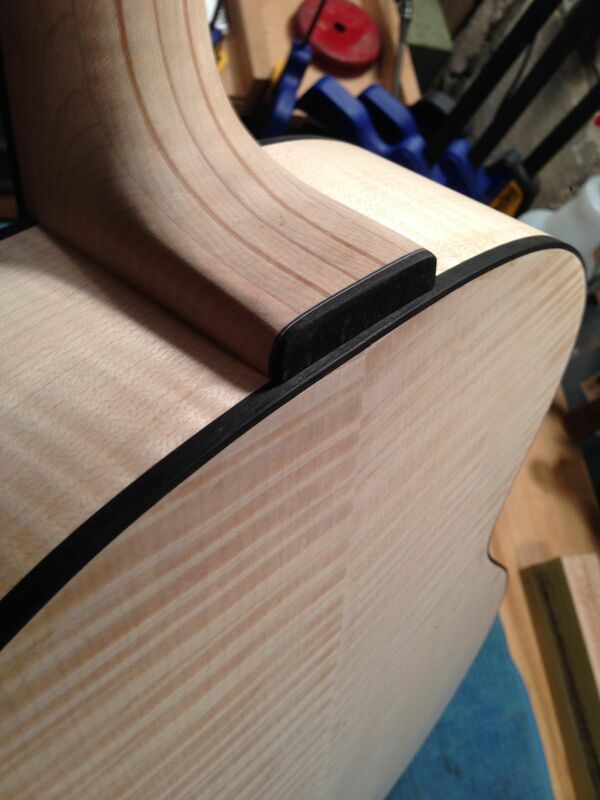 The interior braces are lutz spruce with cedar kerning and a rosewood bridge plate. 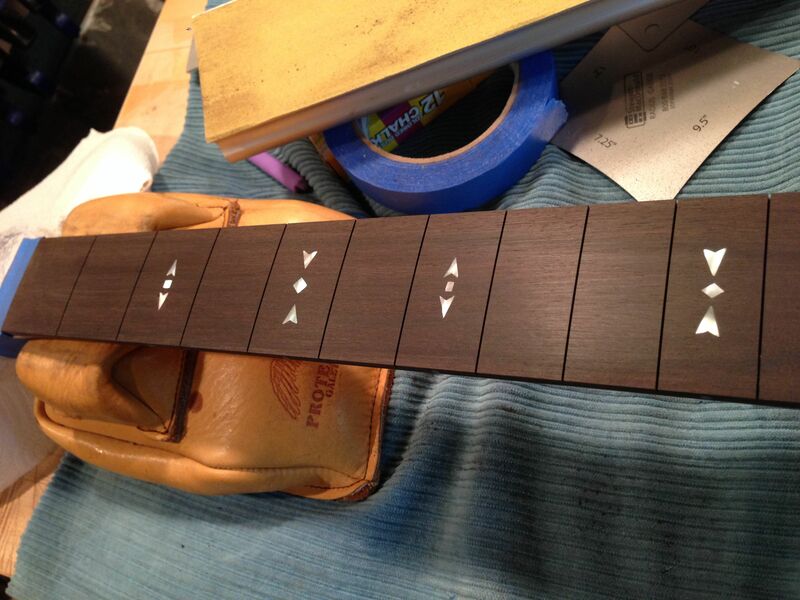 The tuners are Waverly with ebony knobs. The instrument is finished with a traditional hand rubbed shellac (french polish) which brings out the shimmer in the mahogany. This is a delightful instrument. About my work shop. My workshop is in a single small room. Here is a panorama. 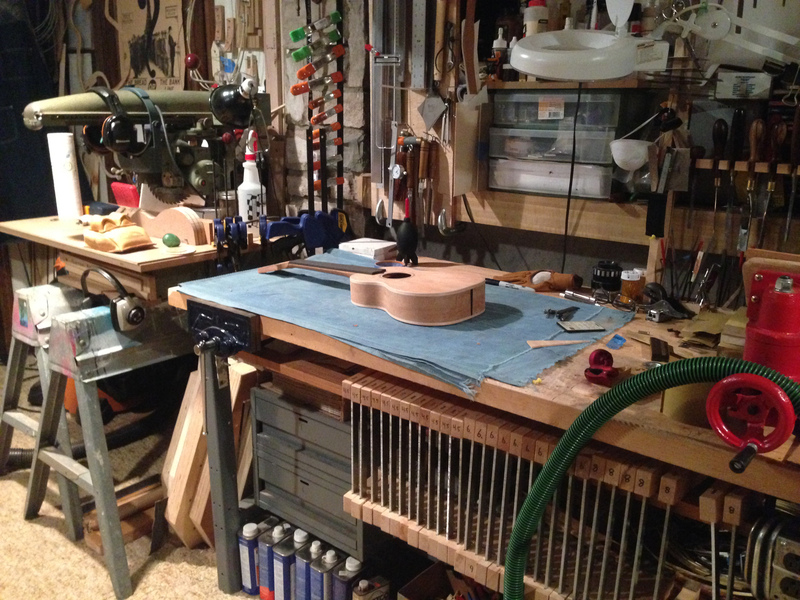 Although this photo makes it look grand it is only about 20 feet x 20 feet wide but offers me enough room to work and display my instruments. Recently I received another instrument back from my finisher. The guitar is a new design for me. It’s body shape is smaller than my standard large bodied guitar. 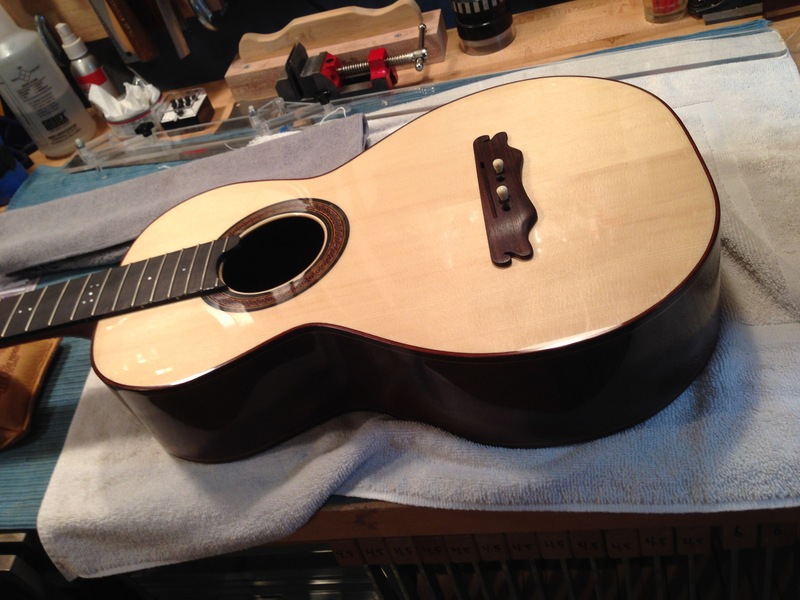 (see my large body guitar “Big Maple” in a previous post). Closer in size to an OM model instrument. The specs. Binding: White Ivoroid with Coral Purfling. 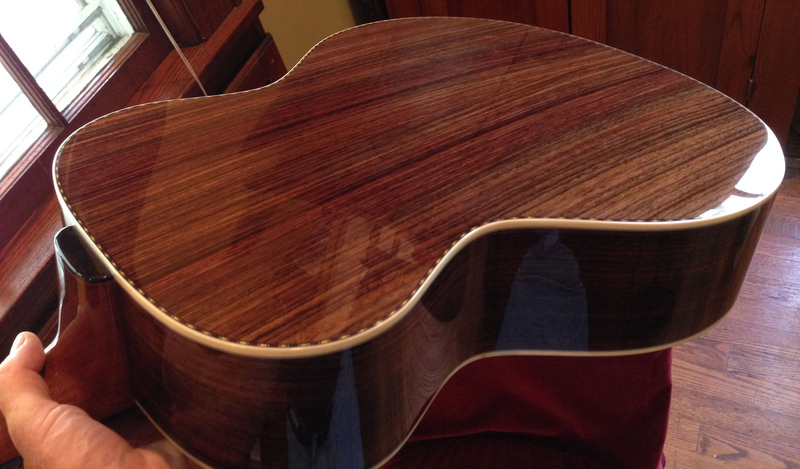 This guitar is constructed of East Indian Rosewood back and sides and a 40 year old Alaskan Sitka Spruce soundboard. It is my understanding that soundboard came from log that was salvaged from a bridge stringer that crossed an Alaskan river before it became soundboards. I purchased one soundboard in 2010 and I wish I had bought more. 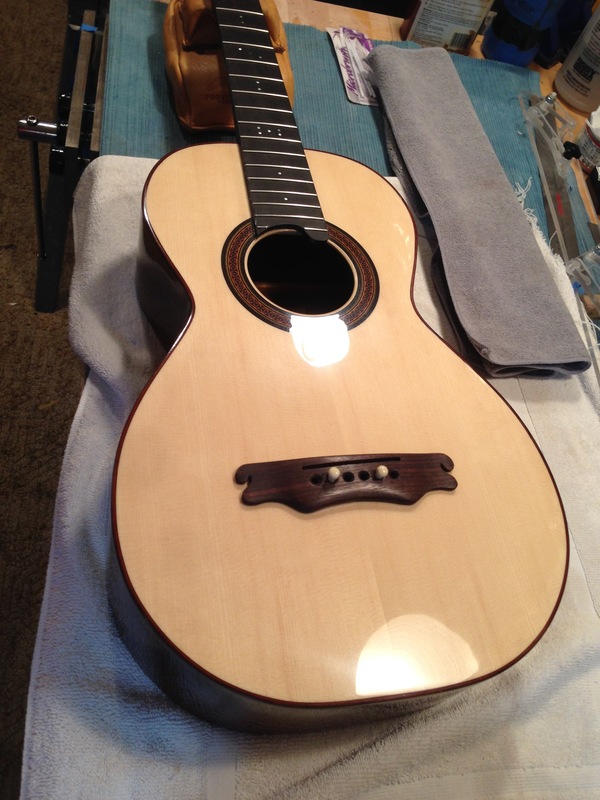 It is a beautiful loosely grained top with an amazing natural color and wonderful tone. Next time I come across these special woods I will have to get a few extras as now I see and hear how wonderful this guitar looks and sounds. This is truly special. The finish on this instrument was done by Tony DiDomenico, htttp://www.DiDomenicoguitars.com, Tony is a great luthier and finisher. 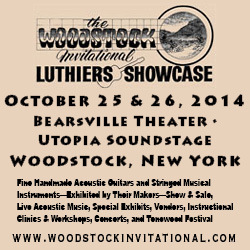 This instrument will be available for purchase at the Woodstock Luthiers Invitational and Showcase in Woodstock, New York, October 25th and 26th., 2014. I hope to see you there. 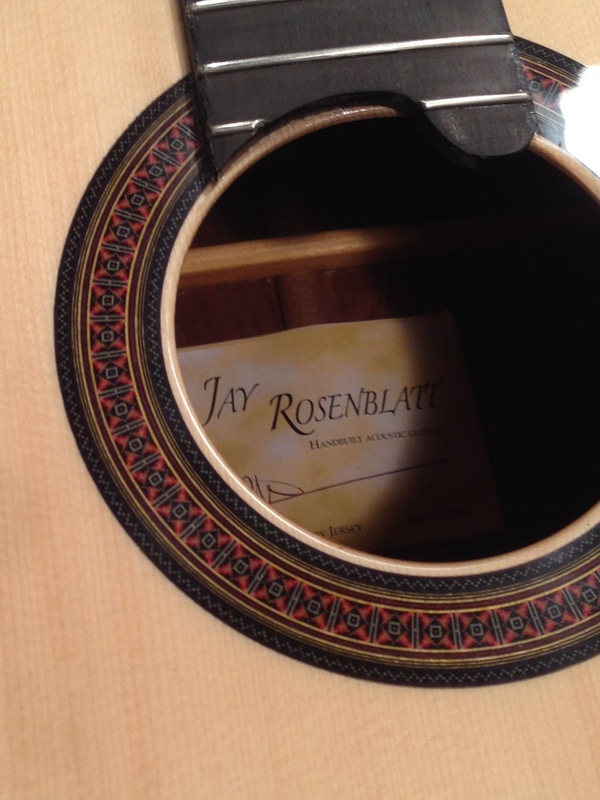 Come see Jay Rosenblatt Guitars in Woodstock, NY in October. Thanks for reading my blog and happy picking!